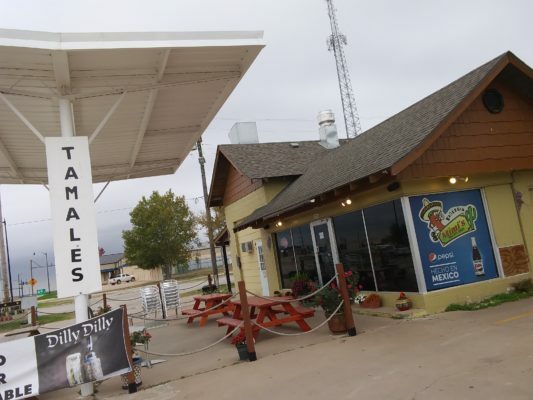 Driving through the bitter end of the small town, having finished with a couple of appointments at the Chickasaw Nation Medical Center, I was heading down Main Street about to hit the travel center and grab some coffee on my way out when, over my shoulder and off to the right, I first saw Mimi’s Taqueria, 1028 W. Main Street. Backtracking a bit and pulling over at what I suppose is a reconditioned filling station, the lluvia fria had been dropping a steady pounding all day and was showing no signs that it was going to let up. Walking through a couple of puddles in their makeshift parking lot, as I wiped my boots outside the door I noticed how small the dining room was. 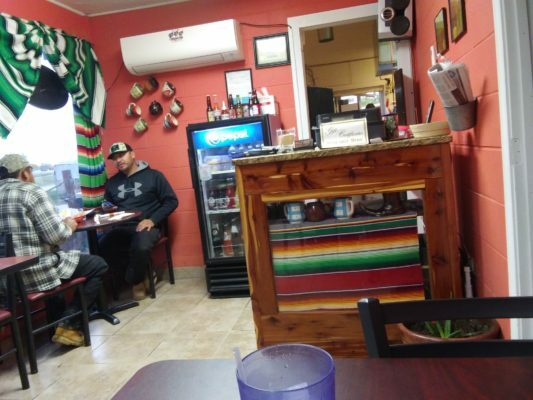 The place was full, with the exception of a table next to the restroom; I made my way in and no sooner than I was sitting down, there was a menu and chips and salsa ready to go. 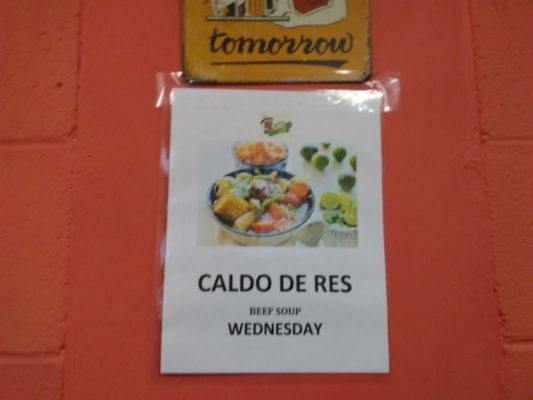 On the wall next to me, however, I realized I was not going to need to see the menu; the Caldo de Res was the special of the day and man, was I churning for a big hot bowl of that tangy brujeria. It looked like it was the right choice too, with cuenco after cuenco coming out from the kitchen, being served to the soaked patrons, many who looked like they had just come off some hard labor, easing back for at least an hour’s worth of warmth. That warmth was something that I was looking for too as I took off my damp hoodie and waited a few minutes for my soup, sipping my Coke Mexicana. There seemed to only be a few people working at Mimi’s—the waitress was apparently doing double-duty in the back, it looked like—but as my bowl of Caldo de Res came out my attention was diverted as I breathed in the homebrew, allowing the broth and spices and other bits of culinary magic to aclarar mi cabeza of all the bad spirits and dark omens I accrued over the long week. Sided with a sturdy bowl of rice and a few corn tortillas, the Caldo wasn’t some Campbell’s condensed Chicken and Stars affair—this sopa machiista was filled with thick cuts of zucchini, squash, carrots and a big ear of corn just hanging there in the middle, swimming around all the fat chunks of beef and bone. I sprayed some fresh lima on top and proceeded to get down. As spoonfuls of beef, vegetables and broth were blissfully devoured, it felt like a ray of warm sunlight was finally shining upon my body from the heavens. Sipping those last few drops straight from the edge of the bowl, I wiped my puckered lips with a manga and noticed that it started to come down even harder outside. I thought maybe a few more minutes wouldn’t matter, but with a constant flow of patrons, I didn’t want to take any more advantage of Mimi and her taqueria than I already had; I give my table up to a couple of manos de rancho and got in the truck, heading on back home, driving on through the rain, the cold Ada rain. Cómpralo ya! The logo of this restaurant is my favorite. I think that pepper is hiding something. I always enjoy Louis’ restaurant reviews, but this one is special. Well done, Sir. I have no words. 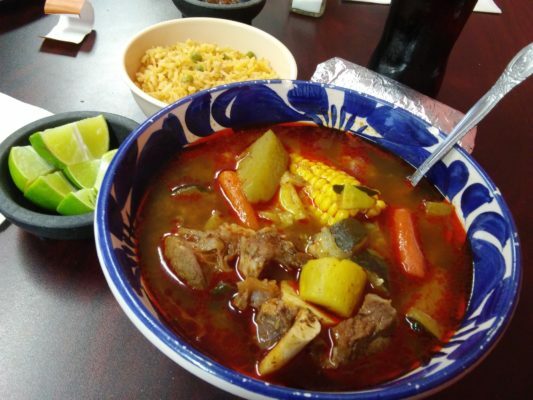 That photo of the caldo is a thing of beauty. Looks as fantastic as you described it. I doubt I’ll ever make it to Ada, but Louis always makes it worth my time to read reviews of restaurants that I’ll never visit. His reviews are always a ray of sunlight like that Caldo de Res.